Squirrel Treefrogs are found in the extreme south of Arkansas. Advertisement Call: Repeating quacks about ½ second apart. Quieter than the Green Treefrog. The Squirrel Treefrog is similar to the bigger Green Treefrog but its lateral stripes are not as defined and it’s call is quieter. The color can vary from green to brown and it may have spots. Interesting Fact: Treefrogs are often called “rain frogs” because they tend to come out before and during storms. These frogs mate from April to August and are opportunistic breeders – any good puddle will do. They produce their call with a single vocal sac. The eggs, which sink to the bottom, will hatch within a month and the tadpoles will complete the metamorphosis within days. The Squirrel Frog belongs to the Hylidae (Treefrog) family and is a New Frog (Neobatrachia). It is well-populated in the southern states and Arkansas is at the limit of its range. 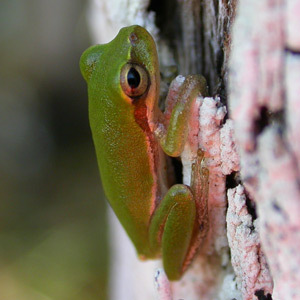 Click for more about Squirrel Treefrogs at Herps of Arkansas.